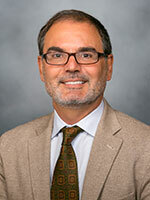 Carlos Iribarren MD, MPH, PhD, has been a research scientist at the Kaiser Permanente Northern California Division of Research since 1997; and an adjunct assistant professor at the Department of Epidemiology and Biostatistics, University of California, San Francisco since 1998. Dr. Iribarren is a clinical epidemiologist and his current research interests include the genetic determinants of coronary disease, inflammation and endothelial dysfunction, and psychosocial factors in coronary disease. Dr. Iribarren is a current member of the American Heart Association Behavioral Science, Epidemiology and Prevention Study Section, and a Consultant for the Health Care Advisors. He was a Fulbright Fellow at the University of Southern California, Los Angeles, from 1989 through 1994. Dr. Iribarren has published 36 peer-reviewed articles (first author of 30) ranging from the health consequences of low-blood cholesterol, body weight change and fluctuations, or cigar smoking to the prognosis of calcification of the aortic arch, hostility and coronary calcification, and heart failure in diabetes. ​Cardiotoxicity of commonly prescribed medications, typically assessed by electrocardiographic features such as prolongation of the QT interval, has regulatory effects and is associated with potentially fatal outcomes. This project aims to advance understanding of the genetic basis for drug cardiotoxicity and its downstream consequences by leveraging the extensive data resources of the Kaiser Permanente Northern California Research Program on Genes, Environment and Health (RPGEH), and the ability to link these data to other health plan databases, namely Kaiser Permanente Northern California’s pharmacy, electrocardiogram, and outpatient/inpatient utilization databases. Longitudinal analyses of the QT interval over up to 20 years will be conducted in the large and ethnically diverse Genetic Epidemiology Research in Adult Health and Aging (GERA) cohort of the RPGEH. Genetic loci that influence adverse drug reactions will be identified and characterized, and the associated biological pathways and tissues will be investigated. This study will also examine: a) genetic predictors of adverse outcomes (e.g., ventricular arrhythmias and Torsade de Pointes), b) whether the identified gene-by-drug interactions are associated with these adverse outcomes, and c) degree of mediation by QTc prolongation. The purpose of this research study is to conduct assays of a selected panel of cardiac, metabolic, and cancer biomarkers in blood samples already collected by the Multiethnic Study of Breast Arterial Calcium Gradation and Cardiovascular Disease (MINERVA) Study (involving 4,491 patients), currently stored at the Kaiser Permanente Research Biobank. The biomarker data will be merged with the study datasets to perform association analyses with risk factors and outcomes. The selected panel includes seven cardiovascular biomarkers (HsTnI, BNP, Galectin 3, Cystatin C, Apolipoprotein A1, Apolipoprotein B, and Lp[a]) and six cancer biomarkers (CA 125, HE4, CYFRA 21-1, PIVKA-II, and SCC). Specific study aims are: 1) To establish a multi-ethnic cohort between the ages of 60 and 79 years with equal representation of white, African-American, Asian and Hispanic/Latina women. All participants will be recruited at the time of their regular screening mammography and will be free of clinical CVD at baseline. A new, validated densitometry method will be used to estimate BAC mass (in milligrams) using digital mammograms; 2) To document race/ethnic variation in BAC mass and to examine associations of BAC mass with sociodemographic background, family history of CVD, traditional and novel CVD risk factors, reproductive health factors, psychosocial factors, selected mineral metabolism factors, selected medication use (statins and nitrogen-containing bisphosphonates), breast size and sleep-related factors; and 3) To elucidate the role of BAC mass in the prediction of coronary heart disease (CHD), cerebrovascular disease, heart failure, peripheral vascular disease and total CVD and to determine whether adding BAC mass to prediction models based on traditional risk factors improves classification of risk for total CVD and its components. Accomplishing these aims will provide novel insights into the utility of BAC mass as a screening tool to assess CVD risk. This study involves statin users with: 1) a major acute coronary event, 2) new onset type 2 diabetes, 3) statin-induced myopathy, and controls free of all three conditions. The objective is to conduct genetic, transcriptomic, proteomic and/or metabolic profiling studies to identify biomarkers of statin response and side effects. The study’s aims are to: 1) ascertain the genomic contribution of common genetic variants to blood pressure (BP) variation within and between multiple ethnic groups; 2) conduct Mendelian randomization experiments using all new and known BP-associated variants to investigate the interplay of genetic BP risk with hypertensive target organ damage including left ventricular hypertrophy, renal dysfunction, and clinical cardiovascular disease across ethnic groups; and 3) perform deep whole-genome sequencing in very extreme individuals for systolic blood pressure to uncover the entire spectrum of allele frequencies. Blood and other body fluids harbor abundant and stable extracellular RNAs (exRNA) which are increasingly recognized as novel potential biomarkers of disease. This study has the main objective of generating reference profiles of both short and long non-coding regulatory exRNA, including environmentally-derived exRNA, from 720 plasma samples collected at the 10-year CARDIA visit. These healthy subjects will be stratified as follows: 180 subjects in each of the following 4 groups: male Caucasian, female Caucasian, male African American, female African American. This study will take advantage of longitudinal data collection in CARDIA to evaluate the association between lung function and risk of future lung disease and cardiovascular disease. The study will perform spirometry in all CARDIA participants at the year 30 examination, and test the hypothesis that individuals with accelerated decline in lung function are at risk for both pulmonary (COPD) and cardiovascular (hypertension, diastolic heart dysfunction, coronary artery disease, and heart failure) diseases. Circ Cardiovasc Genet. 2016 Oct 25. PLoS ONE. 2019;14(1):e0210973. Epub 2019-01-17. Author(s): Dahlin A; Iribarren C; Lu M; Jorgenson E; Wu AC; et al. J Allergy Clin Immunol. 2018 Dec 19. Eur Respir J. 2018 Nov 21. Am J Respir Crit Care Med. 2018 Nov 19. Eur J Cardiovasc Med. 2018 Nov;5(5):544-551. Epub 2018-11-16. Circ Genom Precis Med. 2018 Sep;11(9):e002043. Sci Rep. 2018 May 01;8(1):6853. Epub 2018-05-01. Nat Genet. 2018 Mar;50(3):401-413. Epub 2018-03-05. J Allergy Clin Immunol. 2018 Jan 09. Ann Epidemiol. 2017 Dec 05. J Am Heart Assoc. 2017 Oct 05;6(10). Epub 2017-10-05. J Allergy Clin Immunol Pract. 2017 Sep 18. J Asthma. 2017 Sep 07:1-7. Ann Am Thorac Soc. 2017 Mar 29. J Allergy Clin Immunol. 2017 Jan 17. Nat Genet. 2016 Nov 14. Nat Genet. 2016 Oct;48(10):1171-84. Epub 2016-09-12. J Allergy Clin Immunol. 2016 Sep 14. Am J Hum Genet. 2012 Feb 10;90(2):217-28. Epub 2012 Feb 2. Eur J Nutr. 2016 Jan 27. ​​Genetics. 2015 Aug;200(4):1051-60. doi: 10.1534/genetics.115.178905. Epub 2015 Jun 19. ​Genetics. 2015 Aug;200(4):1285-95. doi: 10.1534/genetics.115.178616. Epub 2015 Jun 19. Ann Noninvasive Electrocardiol. 2014 Sep;19(5):490-500. Epub 2014-05-14. Incidence of malignancy in patients with moderate-to-severe asthma treated with or without omalizumab. J Allergy Clin Immunol. 2014 Sep;134(3):560-567.e4. Epub 2014-03-27. Nat Genet. 2013 Nov;45(11):1274-83. Epub 2013-10-06. Pharmacoepidemiol Drug Saf. 2013 Nov;22(11):1222-32. Epub 2013-07-16. Nat Genet. 2013 Nov;45(11):1345-52. Epub 2013-10-06. Am Heart J. 2013 Sep;166(3):566-72. Risk Adjustment for Health Care Financing in Chronic Disease: What Are We Missing By Failing to Account for Disease Severity? Ann Noninvasive Electrocardiol. 2013 Jul;18(4):389-98. Epub 2013-05-03. Nat Genet. 2013 Jun;45(6):621-31. Epub 2013 Apr 14. PLoS Genet. 2013 Jun;9(6):e1003500. Epub 2013 Jun 6. Nat Genet. 2013 May;45(5):501-12. Epub 2013 Apr 7. Breast Arterial Calcification: a New Marker of Cardiovascular Risk? Curr Cardiovasc Risk Rep. 2013 Apr;7(2):126-135. Epub 2013 Feb 3. Am J Clin Nutr. 2013 Jan;97(1):173-8. Epub 2012 Nov 28. Nat Genet. 2013 Jan;45(1):25-33. Epub 2012 Dec 2. Am J Epidemiol. 2012 Dec 1;176(11):1014-24. Epub 2012 Nov 8. Nature. 2012 Oct 11;490(7419):267-72. Epub 2012 Sep 16. J Womens Health (Larchmt). 2012 Sep;21(9):933-41. Epub 2012 Jun 4. Respiration. 2013;85(5):375-83. Epub 2012 Jun 9. Prim Care Respir J. 2012 Jun;21(2):194-201. Genomics. 2011 Dec;98(6):422-30. Epub 2011 Aug 28. J Am Coll Cardiol. 2011 Oct 4;58(15):1600-7. BMC Nephrol. 2011 Sep 14;12:44. Ann Epidemiol. 2011 Aug;21(8):615-22. Epub 2011 Mar 17. Next generation genome-wide association tool: design and coverage of a high-throughput European-optimized SNP array. ​​Genomics. 2011 Aug;98(2):79-89. doi: 10.1016/j.ygeno.2011.04.005. Epub 2011 Apr 30. BMC Cardiovasc Disord. 2011 Jun 29;11:38. BMC Cardiovasc Disord. 2011 Jun 14;11:31. JACC Cardiovasc Imaging. 2011 Jun;4(6):622-9. Am Heart J. 2011 May;161(5):979-85. Diabetes. 2011 Apr;60(4):1329-39. Epub 2011 Mar 8. Nat Genet. 2011 Mar 6;43(4):333-8. J Cardiopulm Rehabil Prev. 2011 Mar-Apr;31(2):111-9. J Cardiovasc Magn Reson. 2010 Dec 30;12:75. Nat Genet. 2010 Nov;42(11):949-60. Epub 2010 Oct 10. Nat Genet. 2010 Nov;42(11):937-48. Epub 2010 Oct 10. Nature. 2010 Oct 14;467(7317):832-8. Epub 2010 Sep 29. Ann Allergy Asthma Immunol. 2010 May;104(5):371-7. Chest. 2010 Apr;137(4):846-51. Epub 2009 Dec 29. Chest. 2010 Apr;137(4):823-30. Epub 2009 Oct 16. Ann Nutr Metab. 2010;56(2):113-8. Epub 2010 Jan 29. Lipoprotein-associated phospholipase A2 and C-reactive protein for measurement of inflammatory risk: Independent or complementary? Curr Cardiovasc Risk Rep. 2010;4(1):57-67. Clin Chem. 2010 Jan;56(1):111-20. Epub 2009 Nov 5. J Phys Act Health. 2010 Jan;7(1):87-94. PPAR Res. 2009;2009:543746. Epub 2009 Dec 1. J Am Coll Cardiol. 2009 Oct 13;54(16):1542-3. Int J Sports Med. 2009 Sep;30(9):672-6. Epub 2009 Jun 30. Am J Med. 2009 Aug;122(8):778.e9-15. Am Heart J. 2009 May;157(5):939-45. Arch Intern Med. 2009 Feb 23;169(4):342-50. Am J Med. 2008 Nov;121(11):989-96. Hum Mol Genet. 2008 Aug 1;17(15):2320-8. Epub 2008 Apr 28. Ann Allergy Asthma Immunol. 2008 Aug;101(2):130-6. Arterioscler Thromb Vasc Biol. 2008 Jul;28(7):1407-12. Epub 2008 May 1. Arch Intern Med. 2008 Apr 14;168(7):756-61. Soc Sci Med. 2008 Apr;66(7):1603-13. Epub 2008 Jan 28. JACC Cardiovasc Imaging. 2008 Mar;1(2):167-73. Am J Epidemiol. 2008 Jan 1;167(1):42-50. Epub 2007 Oct 10. Am Heart J. 2007 Dec;154(6):1035-42. Epub 2007 Sep 18. Am Heart J. 2007 Dec;154(6):1043-51. Do plasma biomarkers of coagulation and fibrinolysis differ between patients who have experienced an acute myocardial infarction versus stable exertional angina? Am Heart J. 2007 Dec;154(6):1059-64. Am Heart J. 2007 Dec;154(6):1052-8. Physiol Genomics. 2007 Nov 14;31(3):402-9. Epub 2007 Aug 14. Arch Intern Med. 2007 Sep 24;167(17):1846-52. Am J Cardiol. 2007 Sep 15;100(6):981-5. Epub 2007 Jul 2. Ann Epidemiol. 2007 Sep;17(9):669-78. Epub 2007 May 18. Am J Clin Nutr. 2007 Jul;86(1):48-54. J Cardiopulm Rehabil Prev. 2007 Jul-Aug;27(4):227-32. Hum Genet. 2007 Jun;121(5):565-75. Epub 2007 Mar 14. Prev Med. 2007 Jun;44(6):490-5. Epub 2007 Feb 23. J Intern Med. 2007 Mar;261(3):235-7. J Clin Endocrinol Metab. 2007 Feb;92(2):729-32. Epub 2006 Dec 5. Clin J Am Soc Nephrol. 2007 Jan;2(1):81-8. Epub 2006 Nov 29. Nicotine Tob Res. 2007 Jan;9(1):53-6. Am J Epidemiol. 2006 Dec 15;164(12):1150-9. Epub 2006 Oct 13. BMC Cardiovasc Disord. 2006 Oct 26;6:42. Am J Med. 2006 Oct;119(10):884-91. Am J Epidemiol. 2006 Sep 15;164(6):598-606. Epub 2006 Jul 13. BMJ. 2006 May 6;332(7549):1064-9. Epub 2006 Apr 7. Prev Med. 2006 Mar;42(3):193-9. Epub 2006 Feb 15. Does the association between serum endostatin, an endogenous anti-angiogenic protein, and acute myocardial infarction differ by race? Ann Intern Med. 2006 Jan 3;144(1):21-8. Arterioscler Thromb Vasc Biol. 2006 Jan;26(1):5-6. Int J Behav Med. 2006;13(1):44-50. Arch Intern Med. 2005 Oct 10;165(18):2105-13. Health Serv Res. 2005 Oct;40(5 Pt 1):1443-65. Am J Hum Genet. 2005 Jul;77(1):64-77. Epub 2005 May 16. Ann Allergy Asthma Immunol. 2005 May;94(5):566-74. Arch Intern Med. 2005 Apr 25;165(8):923-8. Am J Cardiol. 2005 Mar 1;95(5):626-9. Soc Sci Med. 2005 Feb;60(3):471-82. Am J Cardiol. 2004 Dec 15;94(12):1575-6. Are patients with asthma at increased risk of coronary heart disease? Int J Epidemiol. 2004 Aug;33(4):743-8. Epub 2004 May 6. Am J Respir Crit Care Med. 2001 Dec 1;164(11):2045-50. J Epidemiol Community Health. 2001 Oct;55(10):721-8. Int J Cancer. 2001 Sep 1;93(5):745-50. Am J Epidemiol. 2000 Apr 15;151(8):748-51. Eur Heart J. 2000 Apr;21(7):505-6. Uric acid and serum antioxidant capacity: a reaction to atherosclerosis?